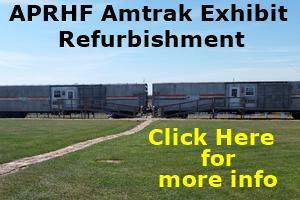 Would you like to be treated like a Railway Baron on your next vacation? 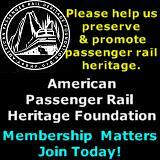 Then visit the rail-fan friendly Izaak Walton Inn, near Glacier National Park, at Essex, Montana. You'll be treated to an exclusive "flag stop" on Amtrak's Empire Builder, which only pauses here at Essex -- just down the tracks from the Inn --, if passengers are detraining. Waiting for you on the platform will be a van from the Inn, which will whisk you and your luggage over to the front desk. This historic property, near a crew-change spot, was built in 1939, between the East and West Glacier stations, as a hotel for Great Northern Railway engine crews. Multiple helper diesel locomotives still growl constantly, waiting to assist heavy freights over the Continental Divide. This is a great spot for watching -- and listening to -- switching operations, with satisfying sounds accompanying the stopping, starting, and accelerating engines. 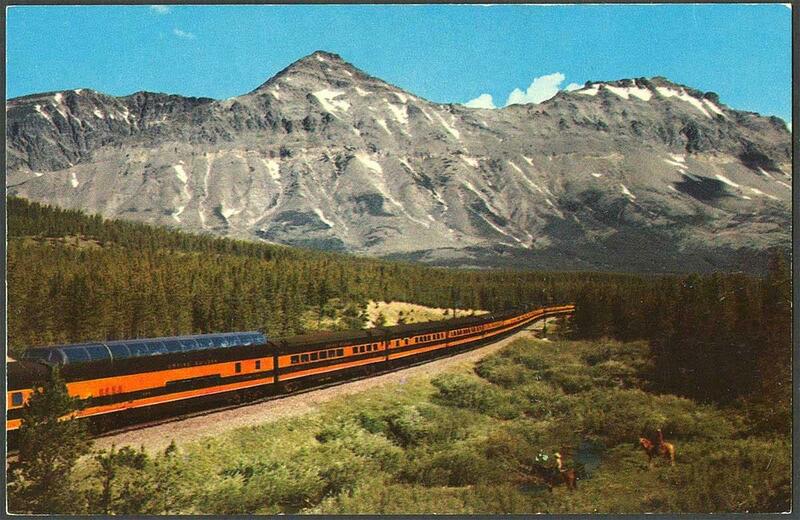 1955 Great Northern Railway "Empire Builder" cruising through the Montana Rockies. Inside the main building, you'll find a rustic lobby with a fieldstone fireplace. There are fairly small accommodations here, some with track views. 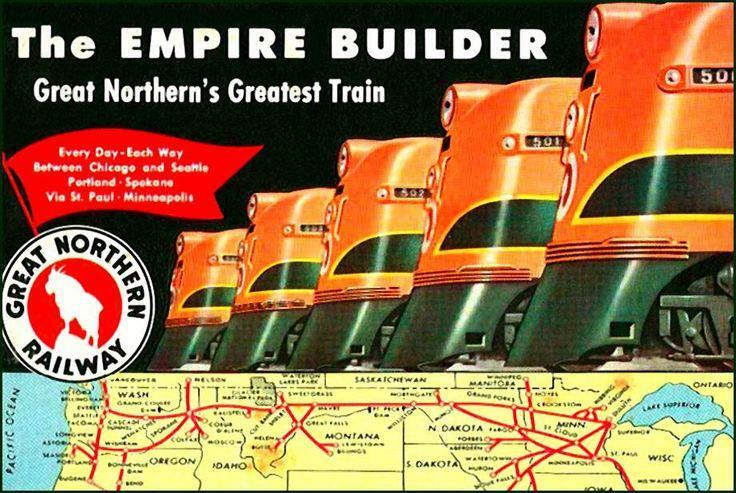 Various memorabilia, such as old Great Northern Railway posters, signs, calendars, and menus, are on display. Advertising poster from the 1950s. 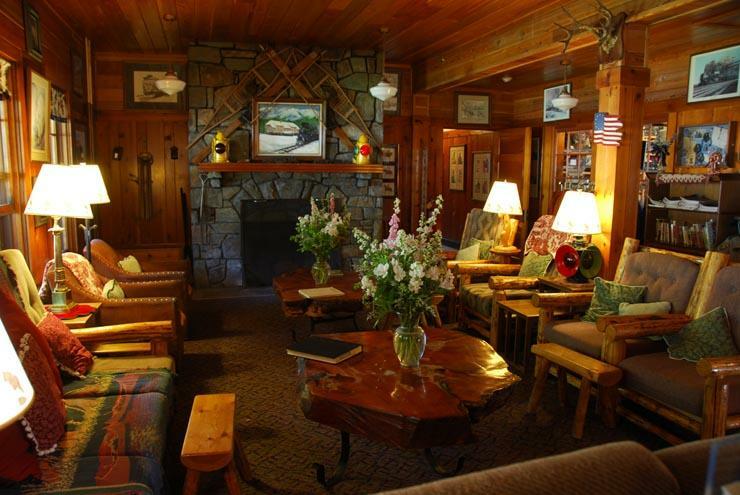 Cozy lobby of the Izaak Walton Inn. The gift shop carries reproductions of china once used on the pre-Amtrak Empire Builder trains. 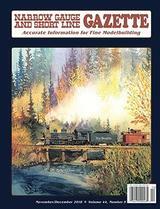 While the Burlington Northern-Santa Fe Railway now owns the tracks past the Inn, you'll soon learn that in the hearts and souls of Montana residents, the vintage Great Northern still lives. The restaurant specializes in huckleberry desserts. 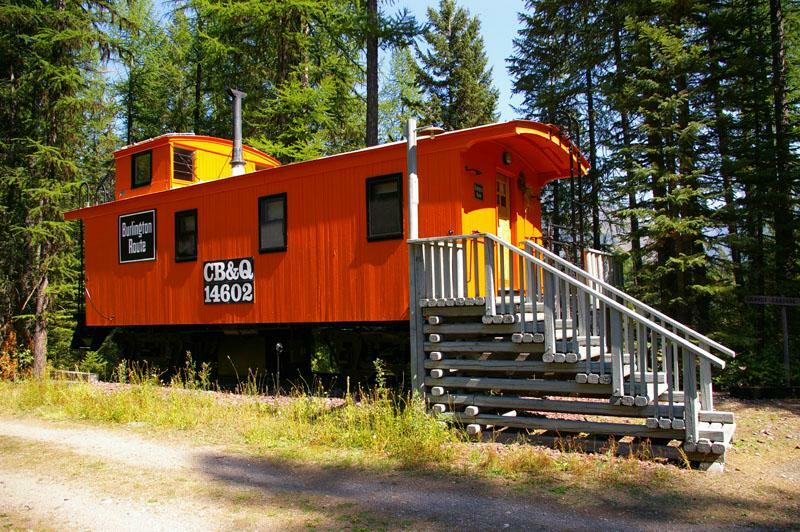 There are private free-standing accommodations on the property inside updated cabooses -- brightly painted in the colors of the railroads they once belonged to. Three of them have been designated as luxury accommodations. 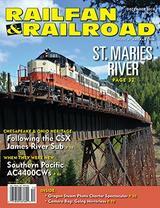 Chicago, Burlington & Quincy �Orange� Caboose Cabin. This restored 1895 �Honeymoon� caboose has wood interior, gas fireplace and full size bed with feather top. Kitchenette includes two-burner cook top, fridge, microwave, toaster, coffee maker & propane grill on the deck. With raised cupolas for excellent views of the passing trains, cabooses are well appointed and perfect for ski-in/ski-out winter fun, and woodsy summer relaxation. 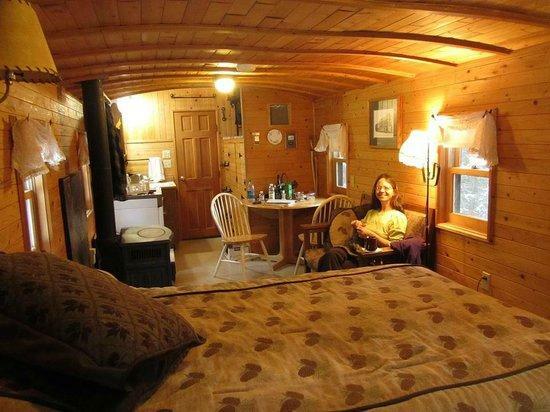 Cozy interior of the Orange Caboose. 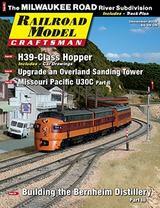 But now, as a Railroad Baron, you'll be transported to the top of the line accommodation. 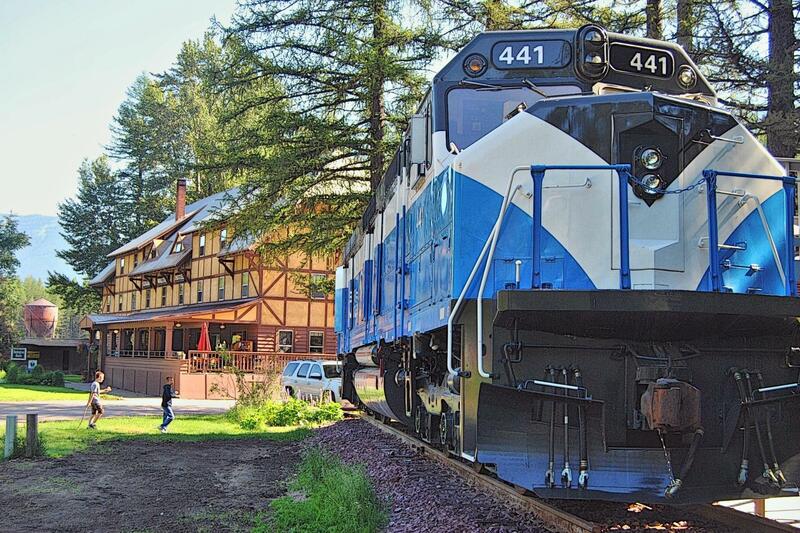 The Great Northern 441 Locomotive is unlike any resort you�ll find in Glacier National Park � or anywhere else! Outside, this historic locomotive represents the Great Northern diesels that once rolled past the Izaak Walton Inn ...Inside, it�s a warm, rustic refuge ... with luxury and amenities unsurpassed anywhere in the Glacier Park area. . . a Montana Argillite stone fireplace . . rubbed oil bronze fixtures . . and a 46-inch LCD television and DVD player. GN 441�s interior creatively reflects Montana�s unique blend of flora, fauna and geology. The bedroom invites you with a king size bed.. a Hudson Bay blanket and pillowcases... Openings for original radiator fans in the roof have been transformed into skylights to let in the Montana sunshine... on those cold Montana nights, you can crank up the coziness with the fireplace. The Inn offers cross-country skiing as well as a game room with a billiard table. In the summer, enjoy hiking, scenic drives (car rentals are available by advanced reservation) over the Going-to-the-Sun highway and to nearby lakes . Essex, surrounded by mountains and rich with wildlife (such as bears and mountain goats), has a year-round population of less than 50. A staff member explained, when we were there: "I couldn't get out the door because a black bear was camping on my front porch". -- one of the most unusual reasons for reporting late for work. 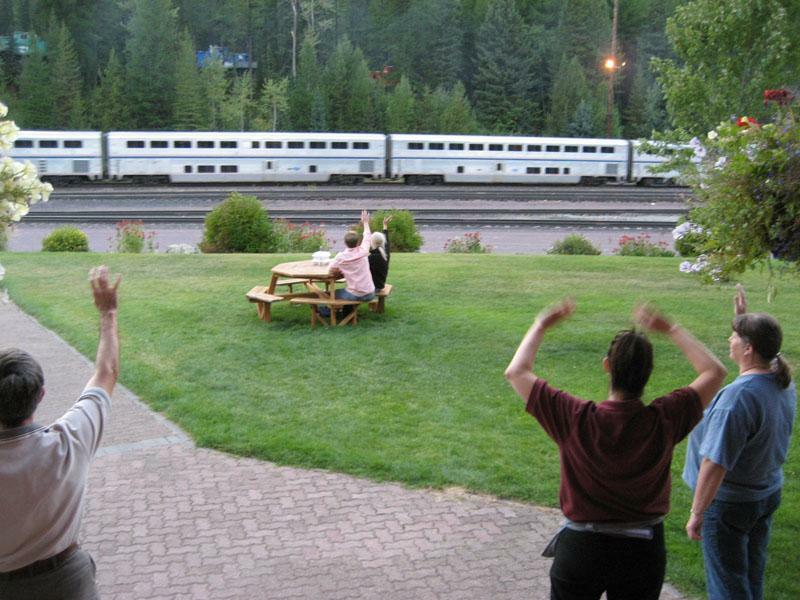 Staff and guests traditionally dash outside to wave at passing Amtrak "Empire Builder". 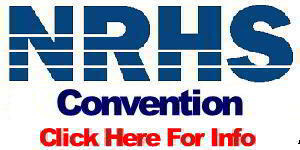 Reservations are available through your travel agent, or at 1 406 588 5700.